A few notes: Themes and Personas are both big categories, and both have a lot of active users, so I would expect to have each their own entry, instead of mixed together (as they are now). Also, with Personas, they can do instant preview and apply, but Themes (as of yet require a restart or re-opening all windows (see the ‘switchthemes’ extension). This looks great, though I still don’t feel convinced that “everything is just a tab” is right. That said, the interactions themselves can live _anywhere_ regardless of what box surrounds it. A well-placed window with the same content area size achieves many of the same goals around size/navigation/not obscuring effects of changes, without dealing with the various visualization issues. Tabs on top can mitigate this, if the “browser” chrome isn’t shown, but bookmarklets etc all scare the crap out of me in these mockups. Well, I think it is certainly an improvement on what is there currently, but I worry if the categorisation will be successful enough for people to work out what is where. What’s the difference between a plugin, an extension and an add-on? Will people know which is which? Logically, personas and themes might go together, but as Alfred’s comment points out, they (currently) behave pretty differently and have different implications for the user. The mock-ups look nice, but my Firefox actually mostly lists various Java and Microsoft bits along with my anti-virus software, which lack icons and in some cases descriptions, and they can’t be uninstalled or rated. Maybe I’m jumping too far ahead, but I worry that giving more space to the content from the add-on means that stuff that may be messy and confusing will get more space than it does now. Your car analogy is interesting, because Firefox’s development model is essentially “Everyone gets Model A”. The add-on system ultimately fails for most users because the add-ons come without a warranty. They are stuck with Model A. From this perspective, any solution involving a better search UI does not help users. What users need is a way to get more models with warranty coverage. They want 2 door or 4 door; value pack or sport pack. They want choice, but choice limited to option sets that work together. Better search should be “pick one of these 8 models, then select among 8 options on each model”. And all 64 results should be known to work. @mconnor regardless of what the choice is for Firefox we will have to be able to display the redesigned add-ons manager in its own window since for some applications the tab option isn’t there or relevant. It will be a per-application choice where they put it. “66% of Firefox users have no add-ons installed” isn’t quite right. The post explains that at least 33% of users have add-ons installed, but we know it’s quite a bit more than that. Correct me if I’m wrong, but wasn’t the OLD way of doing Addon preferences for them to make their own XUL panel and jam that in with the rest of the browser preferences? And then Firefox came along and they realized “hey, I need to configure Addon X, so let me go to where Addon X lives.” And I like that model very much. Also, you’re not really distinguishing between chrome addons and content addons here. I have both. My chrome addons obviously extend the functionality, like Read it Later, Xmarks, and (for the moment), the Strata suite. My content addons are to enhance the sites I use (ie. Gmail) or to protect me (NoScript). Of all my addons, the only one I tell users is critical is NoScript. The browser, as it stands, works just fine for many people without any Addons. Going to where the add-ons live to modify them is very much the model to follow. The question is more where they live, and if they are findable where they live. Because add-ons are arguably more important than any other Preference item, as they have a full community and create virtually any change to the browser, it would be my goal to not obscure them in Preferences, but rather make them more findable as the result of any move. It’s a good point you make about content vs chrome add-ons. We do not distinguish between them today, but perhaps that distinction would make sense in a future design. I can think of a few add-ons that are not fully one or the other, but finding meaningful categories that make sense to tech-saavy and not-so-tech-saavy users will be a main part of this design effort. Thanks very much for the note – I changed it to about half to reflect the 53% of added blocklist pings added to the ratio to the add-on pings. Tabs are a bit cheating, because they can be torn off and treated like a separate (maybe chromeless) window. Removing that Chrome and making this more like a “home tab” with limited Chrome might work. Hell, just pressing back and not going up a level might throw people. Add-on collections probably go closer to creating that, where you can in a sense have a developer environment, or a social networking environment, etc. Still limited, and perhaps the performance drawback of installing multiple add-ons is not made clear. Thanks for the note – figuring out how Personas and Themes live together is what I’m working on currently. The two do work differently, and users interact with them differently, but making this clear without being overly complicated will be a challenge. 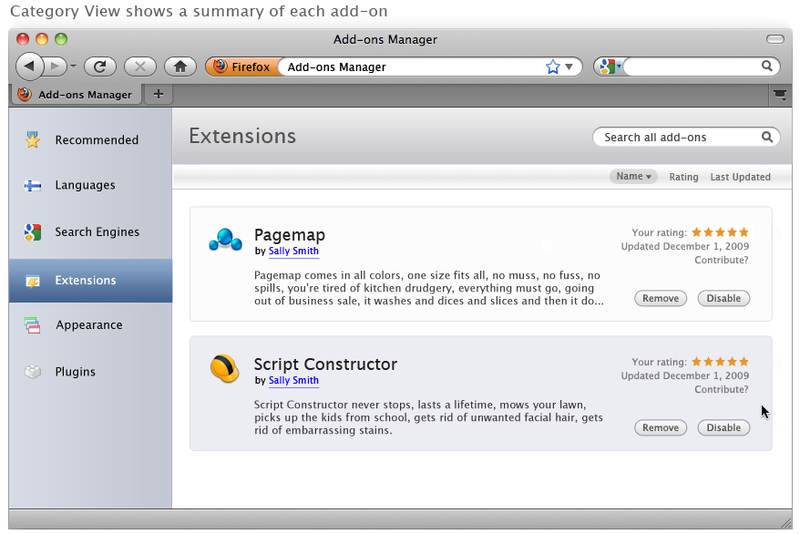 What URL are you choosing for the add-ons manager? In your screenshots the Awesomebar doesn’t have a valid URL. I think the URL is important because this is the web; it means people can refer to the page, hyperlink to it, even perhaps call it with Ajax as a web service from an extension. Google agrees; Chrome chooses chrome://extensions. Chris, I’m not sure the URL is terribly important to be honest. The majority of users will access this through the menus. That said we can easily choose anything we like. We probably won’t be allowing people to link to it from the web for security reasons, and I don’t understand what AJAX services you’d expect this to expose to extensions. – Songbird does the Addons-as-preferences model ATM. – Chrome does the second type of thing, where downloads/history/extensions are their own tabs instead of separate dialogs. I like this. I do like the extended details for each addon shown in the mockup, and the in-line preferences. The chrome-in-tabbrowser approach (complete with orange, err, Larry-area) is interesting; like AJAXy things like Gmail, I would expect the back button to go back to the previous selection, and _not_ the last web page. This may seem odd in the end, though – needs some playing around to be sure. Does the “search in all addons” box search in installed addons (extensions/themes/plugins), installed addons in this category (just extensions), or on a web service (AMO)? I could certainly see random extensions wanting to extend that, so I hope the design has a hookable API. The categories may be hard to deal with – for example, there are extensions in the Appearance category on AMO (not themes/personas); would one find, say, Colorful Tabs there? Choosing the right icon for Languages and Search Engines would be really, really hard, too, if you want to be impartial and things like that. I wonder how scalable the contents would have to be (in some cases it might get constrained to small windows, which would be bad). Having everything in a tab is seductive, eh? Thanks for following the same road! I say go for it on both fronts; the sooner the better! They would fit in nicely and get rid of the disparity, add consistency and simplicity all at the same time. A welcomed change to the new UI redesign!! – You won’t be able to see the effects of updating options on the web pages beneath the window any more. You’ll have to tear off the tab into a separate window, which the majority of users aren’t familiar with. – There’s a risk that it could be spoofable. Who’s going to notice the absence of a differently-coloured logo in the address bar? – It’s going to be easy to lose if you have a lot of browser tabs open at the same time. – You’re mixing concerns. Setting preferences is not the same as web browsing. – Browsers have traditionally had separate windows for setting preferences. Please reconsider and keep this a separate window. Looks good. However, for the average user, I think one of the biggest improvements would be making the terms “add-on”, “extension”, and “plugin” meaningful. These terms have distinct meanings in Mozilla/Firefox which are completely lost on the average user and, if anything, become synonyms, which is wrong. One comment above has already suggested using the URL “chrome://extensions” like the Google browser does. 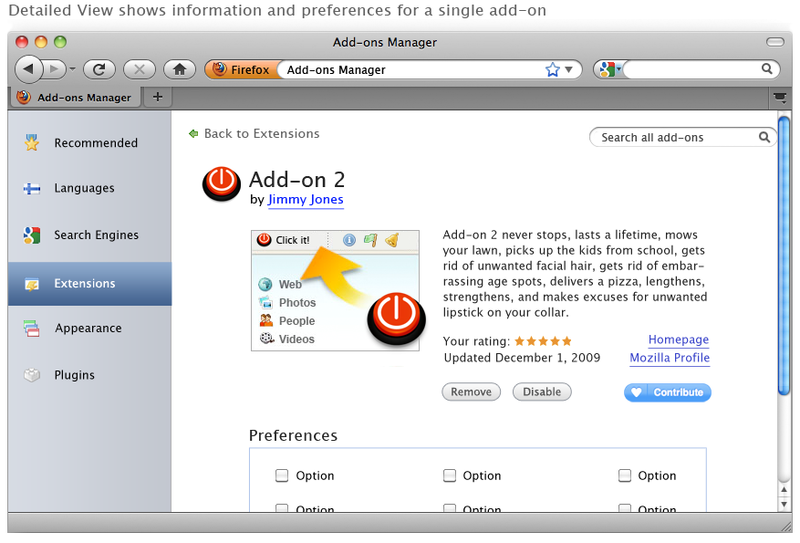 But that would be totally wrong as extensions are just one type of add-on in Firefox speak. Just a case in point. Using the car analogy: people know what a bike rack is, they know what hub caps are, they know what paint jobs are, and they would understand that these all fall under what might be called “customizations”. “Add-ons”, “Extensions”, and “Plug-ins” in common English all have the SAME MEANING and so there is lots of confusion. It would be very interesting to see how these words have been translated into other languages. It would be neat to see a post about that. It’s about time for that change. 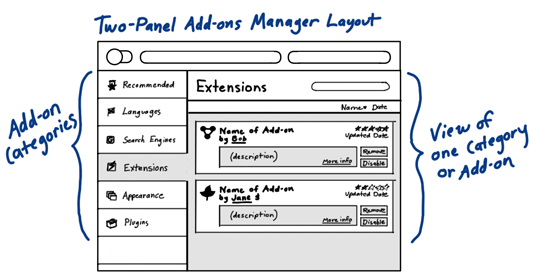 Are you planing to integrade jetpack extensions somehow in this new addon manager? As preferences and Extension are the things I am most often accessing, I have a button for each and use FireFox with the MenuBar Hidden. I like the idea of one preference to rule them all but how will this fit in with FF4.0 changes removing the MenuBar and replacing it with a App Button? AppButton at left and PreButton at right? :`’ I am very thankful to this topic because it really gives useful information “”. Сергеевка-однин из интересных курортов Черного моря, где можно провести свой оздоровительный, недорогой отдых на Черном море. Главное, что привлекает курортниковна море в Сергеевку – это доступность в отношении цены, а качество не уступает 3-х звёздночным отелям. Сергеевка-однин из курортов Черного моря, где можно отлично и недорого отдохнуть летом. Привлекает курортниковна море в Сергеевку – соотношение цены, и качества обслуживания. От нас уезжают чтобы вернуться. Сергеевка-курорт Черного моря, где можно неплохо и недорого отдохнуть летом.Тихий, уютный городок с безлюдными черноморскими пляжами.Чистое черное море и золотой песок.